If you take good care of a cast iron pan, your great grandchildren will be able to pass it on to their children. Heavy and virtually indestructible, good cast iron is an heirloom and a collector's item. Cast iron is so durable that you can take an old pan out of the trash that's covered in rust, clean it up, re-season it and use it as if it were brand new. If you're new to cast iron, make sure you understand what real cast iron looks like so you can purchase an authentic piece. Cast iron pans weight anywhere from 3 to 15 lbs. Pick up your pan and notice the weight. Cast iron pans are heavy; if you have a lightweight pan, it's likely not real cast iron. Look at the bottom of your pan. Cast iron pans are usually marked with the logos of their manufacturers. Common manufacturers include Wagner, Griswold, Lodge, Puritan and Columbus. 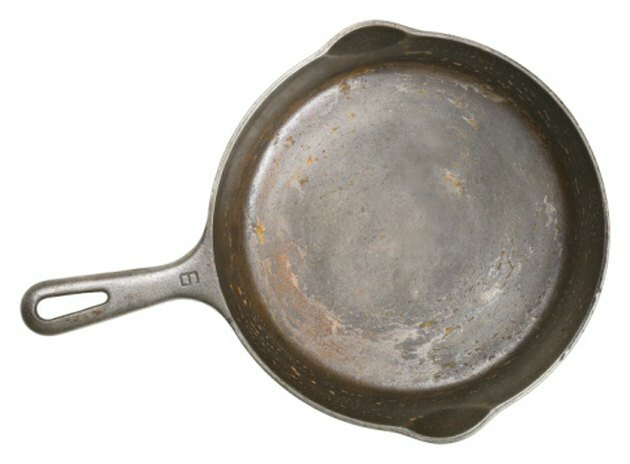 Real cast iron pans likely have a stock number or city name along with the brand name. Examine the pan's surface for rust or discoloration. Cast iron that hasn't been properly seasoned and cared for rusts easily. The rust will be abundant and range in color from green to deep orange. It will also flake away when you touch it. Check the handle to see if it's attached with screws. Real cast iron pans have handles that are part of the original iron mold. If the pan has a handle attached by screws, it's not real cast iron. Examine the surface inside of the pan. If the surface has a shiny, silver Teflon-like or non-stick coating, it isn't cast iron. Real cast iron has either an imperfect surface that's dark silver, dull and slightly rough, or a layer of slick, black seasoning.